Burning is one of the ways how organic matter decomposes. When the burning process is limited only with the surface coat of the wood, the organisms who feed on this organic matter do not have anything edible left and that is why the charred wood is much more resistant to the impacts of the weather. . 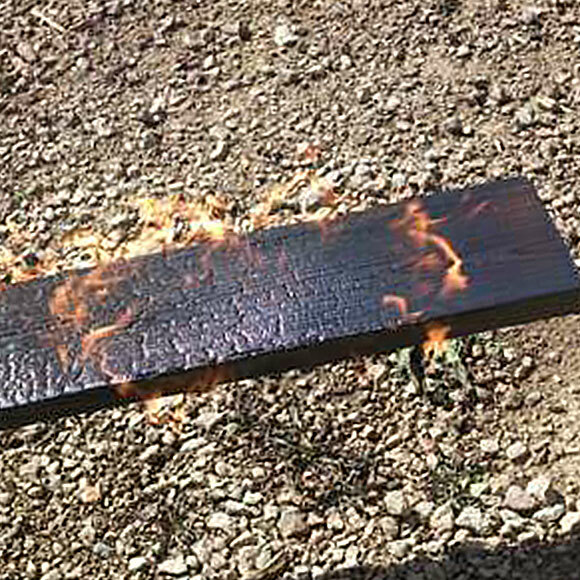 Burning of the wood surface is one of the oldest ways of protecting timber. It is known that Japanese monks implemented this technique already 800 years ago. The Japanese have even given it a name – the Yakisugi technique. 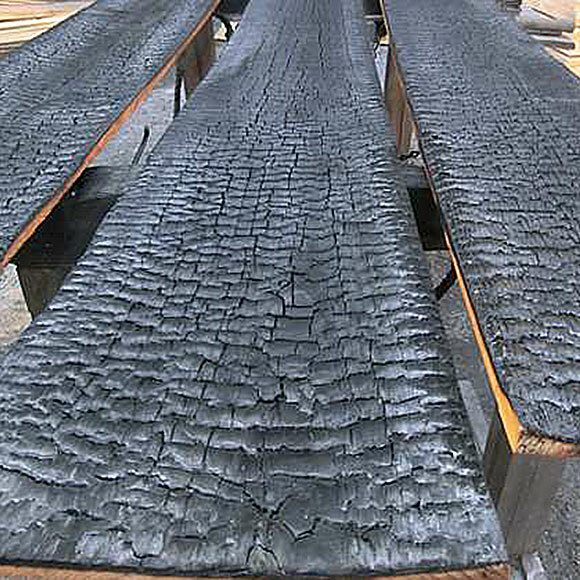 The burned surface can be achieved in different ways. The most common technique is charring bundled wood. For that three wood planks are bundled up, so that a triangular flue would evolve, which is then filled with newsprint. The process of charring begins with lighting the paper between the planks. A special tool is used in order to carbonize the surface of the wood evenly by distributing the flame along the flue formed from the planks. The length of the process will be monitored as soon as the light has spread evenly throughout the whole extent of the flue. Seven minutes is the optimal time for the emergence of the necessary layer of carbon. After that the planks are separated from each other. Further charring is stopped by watering the wood. It is known that Japanese monks implemented this technique already 800 years ago. The Japanese have even given it a name – the Yakisugi technique. However, this technique sets limits for the width and length of the planks. It also requires using even grain and boughless material, which is relatively expensive. Grain around the burls is much more dense than along the timber and the denser the wood, the longer it will burn. Thus, when using a stack method of charring boughed material, the result is uneven and the burning process uncontrollable! Due to the movement of heat from the bottom up, a hot air whirl will arise and it will give more heat to the center part of the plank while the corners will get less heat. As a result the plank will be hollow at the center. Another common way to char the surface of the wood is to do it with a burner, which is much more time consuming, but with the wood available for us it ensures a more consistent and controlled outcome. However, this technology allows to char surfaces with different profiles, which the stack method does not. To obtain an orderly charred surface the experts practical work experience is particularly important! 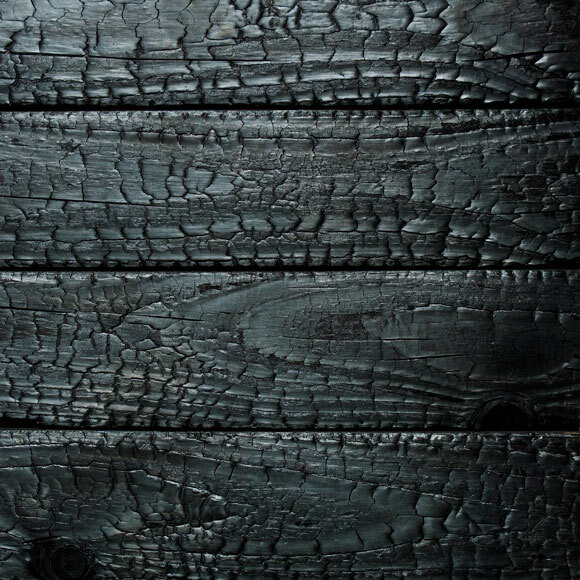 The relief of charring is a matter of taste, but if you want to carbonize the surface to protect the wood the recommended charred coat is 3mm minimum!